LeBron Raymone James (pronounced /ləˈbrɒn/; born December 30, 1984) is an American professional basketball player for the Miami Heat of the National Basketball Association (NBA). Nicknamed “King James”, he was a three-time “Mr. Basketball” of Ohio in high school, and was highly promoted in the national media as a future NBA superstar while a sophomore at St. Vincent – St. Mary High School. At just 18, he was selected with the number one pick in the 2003 NBA Draft by the Cleveland Cavaliers and signed a shoe contract with Nike before his professional debut. Listed as a small forward, James has set numerous youngest player records since joining the league. He was named the NBA Rookie of the Year in 2003–04, NBA Most Valuable Player in 2008–09 and 2009–10, and has been both All-NBA selection and an All-Star every season since 2005. In 2010, a much-publicized free agency process ended with James going to the Miami Heat. He became the third reigning NBA MVP to change teams and the first since Moses Malone in 1982. The focal point of the Cleveland offense, James led the team to consecutive playoff appearances from 2006 through 2010. In 2007, the Cavaliers advanced to the Conference Finals for the first time since 1992 and to the NBA Finals for the first time in franchise history. James has been a member of the USA national team, winning a bronze medal at the 2004 Olympics and gold at the 2008 Olympics. 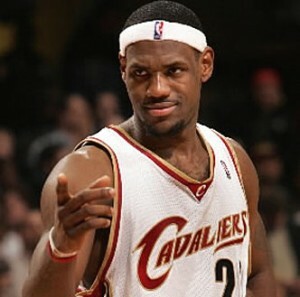 LeBron James left Cleveland in July 2010 to go to the Miami Heat. James came under fire for hosting a prime time special called “The Decision,” where he announced that he would sign with the Heat along with other NBA stars Chris Bosh and Dwyane Wade. Posted in Bios and tagged Bio, LeBron. Bookmark the permalink.